Golden Book Award Winner. A spooky and funny heroic fantasy adventure for children 8-14. 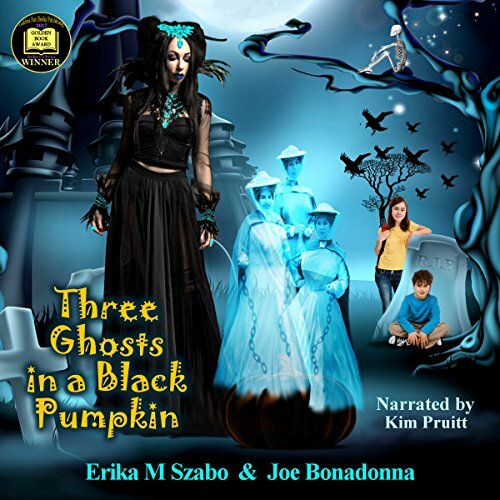 Nikki and her impish cousin, Jack, find a mysterious black pumpkin in the forest on Halloween. A wise talking skeleton, Wishbone, tells them that the ghosts of the Trinity of Wishmothers are trapped inside the pumpkin and can’t be freed without their wands. The children offer their help, so the skeleton takes them on a journey to the world of Creepy Hollow to retrieve the three wands he hid long ago in Red Crow Forest, the Tower of Shadows, and the Cave of Spooks. Ghoulina, the beautiful vegetarian ghoul, and Catman, who was once a man, join them on their quest. They must face danger and conquer evil every step of the way as they search for the Wands before the wicked Hobgoblin and his henchman, a Tasmanian Devil, can get their hands on them. This is a fun, humorous and touching story for kids, with plenty of character interaction woven into a backdrop of scary danger, heroic action, and lessons to be learned.